Social isolation is common in elderly populations and refers to a complete or near-complete lack of contact with other people. As their health deteriorates and friends and spouses die, elders are at an increased risk for social isolation. Social isolation is distinct from loneliness, the latter often being considered to be the subjective counterpart of the former. Late life depression is the onset of depression for the first time in a person over sixty years of age. loneliness: The condition of being lonely; solitude; seclusion. late life depression: Late life depression is the onset of depression for the first time in a person over sixty years of age. social isolation: Social isolation refers to a complete or near-complete lack of contact with society. It is usually involuntary, making it distinct from isolating tendencies or actions taken by an individual who is seeking to distance himself from society. Human beings, by nature, are social creatures. Throughout the socialization process, we become accustomed to living in groups and interacting with others. Individuals in every society, however, at times must cope with social isolation, which is defined as a complete or near-complete lack of contact with others in society. Social isolation is usually involuntary, making it distinct from the isolating tendencies some individuals may have that lead them to purposefully distance themselves from others. Social isolation is also distinct from loneliness. Loneliness is a subjective experience associated with a temporary lack of contact with other humans. Social isolation, by contrast, can be objectively measured in terms of a person’s social contacts and relationships. Friends: Maintaining friendships and building relationships is an important aspect of old age that wards off social isolation. Any individual from any segment of society may be socially isolated, but senior citizens are especially susceptible to the risk factors that may trigger social isolation. These include living alone, family violence, loss of a spouse, aging-related cognitive impairments and disabilities, and transport issues. Consequences of social isolation can be dangerous, particularly for individuals already predisposed to health problems. Studies have demonstrated that seniors who are socially isolated seniors are less likely to take advantage of health and social services. This indicates a circularity of social isolation and health: individuals who are already marginalized are not pushed toward healthcare and individuals with quickly deteriorating health are more likely to be socially isolated. Extended social isolation can contribute tolate life depression, which is a major depressive episode occurring for the first time in an individual over sixty years of age. Social isolation is a larger problem for elders now than in the past, due to the decreasing size of families in Western countries. In the past, elders were not at increased risk for social isolation because they would move in with their children. Now, many elders are moved into elder homes with less frequent contact with their children. However, many elder homes and retirement facilities are working to combat social isolation by increasing programming for their residents. Ageism is the discrimination of groups because of their age, and applies especially to the elderly. Elders frequently encounter prejudice as others assume stereotypes about them to be true. The idea of ageism was developed by gerontologist Robert Neil Butler. Prejudices most frequently surface in the course of medical treatment and in the workplace. term limit: A legal restriction that limits the number of terms a person may serve in a particular elected office. ageism: The treating of a person or people differently from others based on assumptions or stereotypes relating to their age. Ageism is the stereotyping and discrimination against individuals or groups because of their age. Ageism can be applied to discrimination against any age group, such as discrimination against teenagers, but this section will focus on ageist discrimination against seniors. The term was coined in reference to discriminatory practices against the elderly by gerontologist Robert Neil Butler. He coined the term by intentionally mirroring it after other forms of discrimination, such as sexism or racism. Many people are prejudiced against seniors, beginning with the common stereotypes of older adults. Old people are frequently assumed to be in poor physical or mental health and lack psychological agility. It is a common presumption that, as people age, they become more inflexible and conservative in their opinions. Older adults are frequently presumed to be poor drivers. In fact, studies have demonstrated that older drivers, up until the age of about 75, are actually safer drivers than young drivers. Unfortunately, elder patients are frequently discriminated against in the course of medical treatment due to stereotypes based on their age. Studies have demonstrated that elder patients are less likely to have their medical care explained to them, partially because physicians assume that they are unable to understand medical complexities. 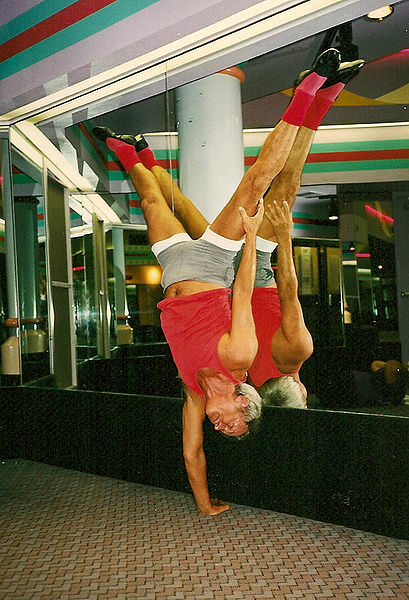 Age is just a Number: This man clearly defies ageist perceptions of older people as being physically infirm and weak. Older adults commonly encounter prejudice in the workplace. It is frequently assumed that an elderly person is mentally inept and incompetent. Employment discrimination, or the presence of discrimination against a targeted group in the workplace, manifests in two different ways vis-à-vis elderly workers. Individuals who began working for a company in their younger years can be pushed out as they age. This process refers to company management redirecting clients away from the older employees and toward the younger employees. Alternatively, companies may not hire older employees to begin with. Joanna Lahey, a professor at the Bush School of Government and Public Service at Texas A&M University, has found that firms are 40% more likely to give a hiring interview to a younger candidate than to an older candidate. This suggests that firms are more interested in hiring younger employees than older employees. The government has tried to combat age discrimination through laws such as the federal Age Discrimination in Employment Act of 1967 which forbids employers from discriminating against employees over the age of forty. This goes against the age stratification theory of society, which states the unequal distribution of wealth, power and privileges among people at different stages in the life course. According to age stratification theory, younger and older people should be a disadvantages due to their position in life, whereas middle-age people would be at at advantage. 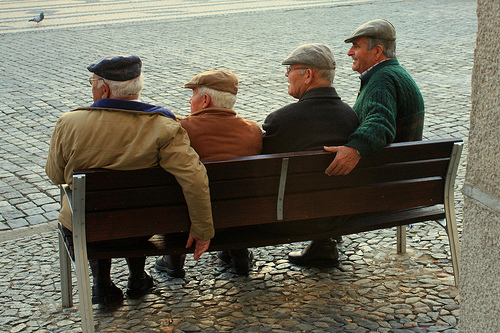 Aging and its impact on the workforce is also an issue for certain sectors of government. The issue has been highlighted as it pertains to the United States Supreme Court. Justices at the Supreme Court are given lifetime appointments, meaning that they do not have to retire or step down from the bench until they choose to or until their deaths. However, as in any other workplace, the potential senility of aging Supreme Court justices has been hotly debated. Former Chief Justice William Rehnquist, for example, was appointed to the Supreme Court in 1986 and served until his death in 2005. He was only weeks shy of his eighty-first birthday when he died and had been in declining health for the last few years of his life. Treatment for anaplastic throat cancer forced him to miss many arguments in the year before his death. Rehnquist’s death reignited a political debate about instating term limits for Supreme Court justices in place of lifetime appointments, such that a justice would be forced to retire after a certain number of years. There are many political and legal reasons supporting both sides of the debate, but assumptions about the declining health of older justices, many of whom serve on the court into their seventies, play a prominent role in the discussion. Elder abuse is the use of physical or mental harm against people of an older age. Elder abuse is an umbrella term that refers to all types of abuses against older adults perpetrated by trusted individuals upon whom these elderly people typically depend. Domestic elder abuse is committed by an elder’s family or friends, while institutional elder abuse is committed by employees at facilities and institutions designated to take care of elders. Grooming occurs when friends or neighbors build relationships of trust with elders in order to gain control of their finances. institutional elder abuse: Institutional elder abuse is committed by workers at residential facilities for elders, such as nursing homes. domestic elder abuse: Domestic elder abuse is committed by an elder’s family or friends. grooming: Grooming occurs when friends or neighbors build relationships of trust with elders in order to gain control of their finances. Elder abuse is an umbrella term that refers to harm done to older adults. Typically, the harm is committed through intentional or neglectful acts by a caregiver or “trusted” individual that cause physical or emotional harm. A significant factor that distinguishes elder abuse from other types of harmful behavior involves the commission of harms where there is an expectation of trust extending from the older person to his abuser. 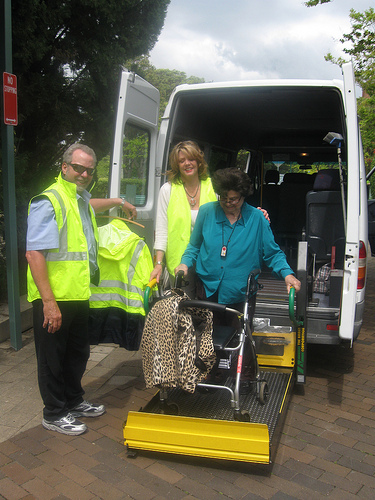 Elder Abuse: Imagine if the people elders depended on the most, such as these community transport service workers, were to breach that trust and abuse them. Elder abuse is illegal; special protections have been established to protect elders who are dependent upon others. However, because elder abuse is such a wide-reaching term, it can be difficult for different jurisdictions to define the term for legal usage. The main types of elder abuse include physical abuse, emotional abuse, financial abuse, sexual abuse, and neglect. Physical abuse of elders includes the hitting, punching, slapping, burning, pushing, kicking, restraining, or false imprisonment of elders. Additionally, giving an elder excessive or improper medication qualifies as physical abuse. Emotional abuse includes shouting, swearing, frightening, or humiliating an elder. Financial abuse is the illegal or unauthorized use of a person’s property, money, pension, or will. Sexual abuse for elders is when an elder is forced to take part in any sexual activity, including participating in conversations of an unwanted sexual nature. Elders with dementia may not be able to consent to any sexual activity whatsoever. Neglect includes depriving an elder of food, heat, clothing, or essential medication. Deprivation may be active or passive, occurring intentionally or from a lack of knowledge. Elder abuse is further subdivided into domestic elder abuse and institutional elder abuse. Domestic elder abuses are committed by family and friends of an older person; institutional elder abuse is committed by workers at residential facilities for elders, such as nursing homes. Regardless of whether the perpetrator is a family member, friend, or institutional caretaker for an older person, a central theme throughout all of these different types of abuses is the relationship of dependency of elders with those who care for them. Serious offenses can be committed by abusive groomers through grooming an older person by befriending him or her in order to build trusting relationships that can then be exploited. Older people living with no adult children nearby are particularly vulnerable to grooming by neighbors and friends who might seek to gain control of their estates. Unfortunately, the nature of dependency inherent to elder abuse can make cases of elder abuse especially difficult to prosecute. For example, an elder might not believe that someone close to him is taking his money or might be persuaded to report that he wanted it as such, when this wasn’t the case. Elders are a particularly vulnerable population because they are dependent upon others and may even be senile, which makes it easier for them to be manipulated. Elder abuse can have serious consequences. Elder abuse can destroy a victim’s quality of life by limiting his functional abilities, increasing dependency, increasing his sense of helplessness, increasing stress, worsening his psychological decline, inducing dementia, and risking malnutrition or overmedication. Elder abuse can even result in death. Of course, the horrible consequences listed above can arise directly from the physical abuse of a victim. Additionally, while an elder may be too senile to comprehend the abusive relationship, stress can seep through his lack of comprehension and perpetuate and even exacerbate preexisting health problems. The risk of death for elder abuse victims is three times higher than for non-victims. Although health problems rise when one comes into older age, social effects also exacerbate of medical ailments by the elderly. As we age, we experience health problems with greater frequency. Cardiovascular problems, cancer, and dementia are common problems for the elderly. Geriatrics is a field of medicine that concentrates on treating the medical problems of older adults. An elderly person’s social environment has serious consequences on the type of care received and the effect it has on the individual’s health. dementia: A progressive decline in cognitive function due to damage or disease in the brain—beyond what might be expected from normal aging. Areas particularly affected include memory, attention, judgement, language and problem solving. arteriosclerosis: Hardening, narrowing or loss of elasticity in arteries or blood vessels. geriatrics: The branch of medicine that focuses on health promotion and the prevention and treatment of disease and disability in later life. The term itself can be distinguished from gerontology, which is the study of the aging process itself. As we age, we face more and more health problems. According to the Centers for Disease Control and Prevention, the leading causes of death for Americans are heart disease and cancer. Statistically, heart disease and cancer account for the most American deaths by far. In 2009, heart disease claimed 599,413 lives and cancer was responsible for 567, 628 deaths. Of course, these numbers include all ill individuals, not just the elderly. Because of the prevalence of heart disease and cancer among the elderly, many American hospitals have developed programs to treat seniors with these particular afflictions. Geriatrics is the field of medicine that specializes in treating older adults. Cardiogeriatrics refers to the branch of healthcare that treats heart disease in older adults. Heart disease is common in seniors because as one ages, one’s heart muscle begins to weaken and change in adverse ways. As the heart ages, one can develop arteriosclerosis, or the stiffening of arteries due to the accumulation of fatty buildup, or plaque, along the walls of the arteriesm, restricting blood circulation. Arteriosclerosis is common to older adults that contributes to congestive heart failure. This is the condition defined by the inability of the heart to provide adequate blood flow to the body. Congestive heart failure is common, costly, disabling, and potentially deadly. In developed countries, around 2% of adults suffer from heart failure. Risk rises with age. In developed countries, 6–10% of adults over the age of 65 suffer from congestive heart failure. Congestive heart failure increases the risk that one will experience a myocardial infarction, or heart attack. In a heart attack, blood supply to the heart is interrupted, causing damage to the heart muscle. When blood flow is stopped from going to the brain, usually due to a blood clot, one suffers from a stroke. Americans have more than 700,000 strokes every year, making it the third leading cause of death in the United States after heart disease and cancer. Nearly 75 percent of strokes occur in people over the age of 65, and the risk of having a stroke more than doubles during each decade between the ages of 55 and 85. Other than cardiovascular diseases, cancer is the most common, serious illness faced by the elderly. While anyone can develop cancer, the risk of getting certain cancers increases with age. Breast, colorectal, prostate, pancreatic, lung, bladder, and stomach cancers are especially linked to aging. Cancer can be even more difficult to treat in the elderly than in younger patients because treatment can be stressful on the body. Treating cancer involves some combination of radiation, chemotherapy, or surgery, all of which are more stressful on an aged body than a younger body. Recognition of the stress that treatment may have on an older body limits the options available for treatment. Older adults are also more susceptible to certain neuropsychological disorders, such as dementia and Alzheimer’s disease, that are virtually unseen in younger populations. Dementia is a serious loss of global cognitive ability in a previously unimpaired person—beyond what might be expected from normal aging. It may be static—the result of a unique brain injury—or progressive—resulting in long-term decline due to damage or disease in the body. Dementia is not a single disease, but rather a syndrome that is associated with a variety of different diseases, such as Alzheimer’s. Symptoms of Alzheimer’s include confusion, irritability, aggression, mood swings, difficulty with language, and memory loss. Most often, Alzheimer’s disease is diagnosed in people over the age of 65. In 2006, there were 26.6 million sufferers worldwide. One in eight Americans over the age of 65 suffers from Alzheimer’s and that number is set to rise in future years as the average lifespan continues to rise. Obviously, aging presents serious concerns about health. A person’s body is more likely to encounter disease as he or she ages. Frequently, preexisting medical ailments are exacerbated by social determinants of health. Social determinants of health are the extra-biological factors that influence how individuals experience their own health. For example, congestive heart failure does not necessarily kill someone. However, the patient with congestive heart failure is most likely going to be put on a complicated medication regime. Congestive heart failure combined with dementia—or even normal forgetfulness associated with aging—makes adhering to a strict regimen difficult for many older adults. The elderly are frequently dependent on younger adults for assistance. The types of care to which the elderly have access can have serious medical consequences. 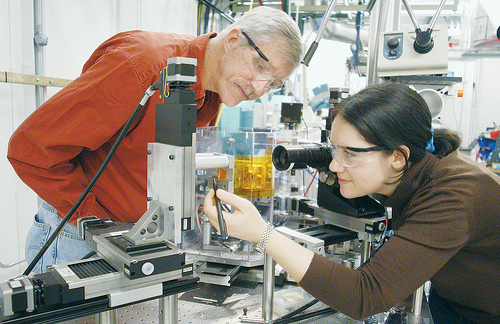 Studying Alzheimer’s Disease in the Argonne National Laboratory: Mark Davidson (left), University of Florida, and Joanna Collingwood, Keele University, scrutinize a sample of Alzheimer’s brain tissue.